When we first immigrated to Canada from Holland in 1951, we settled in Toronto. 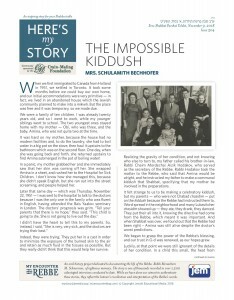 It took some months before we could buy our own home, and our initial accommodations were very primitive – in fact, we lived in an abandoned house which the Jewish community planned to make into a mikveh. But the place was free and it was temporary, so we made do. I was born in Russia right after World War Two ended. It was very hard being Jewish under the Soviet regime; although we managed to practice Judaism, everything had to be secret, everything had to be done behind closed doors. 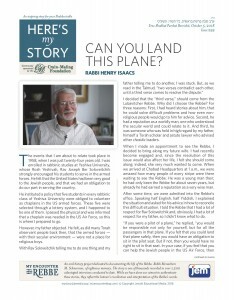 Thanks to the Rebbe’s assistance, my grandparents got out in 1958 and came to Israel. The Rebbe had started to get Jews out around that time when, with Nikita Khrushchev as premier, the Soviets had become more sensitive to international pressure. The Rebbe did things quietly, without fanfare. He ran an entire Jewish underground under their noses and got away with it. 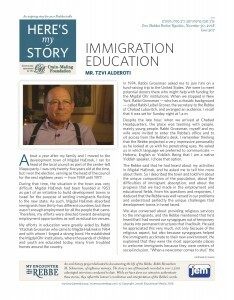 I left with my parents in 1968, but whereas they settled in Israel, I came to study at the Chabad Headquarters in Brooklyn. While I was in yeshivah there, my parents came to New York for an audience with the Rebbe. 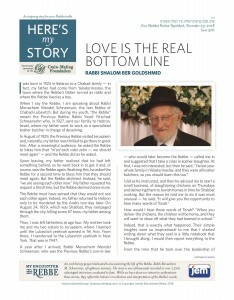 I remember that my mother broke down in tears when she told the Rebbe that her sister couldn’t get out of Russia. 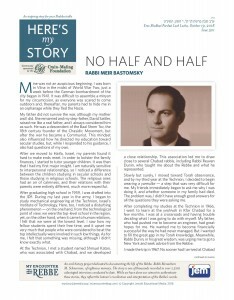 Her sister’s husband had been in jail for eight years for teaching Torah, and my mother was certain there was no way that the KGB would let someone like that go. At the same time, he was unemployable as he could not find a job that would let him take off for Shabbat, and the family was in dire straits. Six months later, my mother’s sister and her whole family managed to emigrate! After the Six Day War, in 1967, my wife and I decided to move from the United States to Israel with our young family. Before the move, I came over on a pilot trip and was granted a job interview at the Israeli Ministry of Defense. After they conducted a lengthy investigation, to my great joy, I was hired. I went to work for the Ministry of Defense using my skills as a Harvard-educated lawyer to negotiate contracts for the purchase of defense equipment including submarines. I didn’t know what to make of his statement at first, and only later on did I figure it out. This was in April of 1973, six months before the devastating Yom Kippur War. The Rebbe obviously anticipated that something ominous was on the horizon. A departure of key personnel in the Ministry of Defense at such a time would have been disastrous. They consulted the Rebbe – as apparently was the practice of certain Israeli government officials – and they followed his advice. As for myself, since I was not yet a chasid, I didn’t ask the Rebbe; I simply left and took the better paying job, as general counsel at Etz Lavud, a big Israeli company then selling mostly wood and plywood. Mine was not an auspicious beginning. I was born in Vilna in the midst of World War Two, just a week before the German bombardment of the city began in 1941. 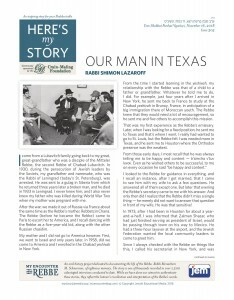 It was difficult to assemble a minyan for my circumcision, as everyone was scared to come outdoors and, thereafter, my parents had to hide me in an orphanage while they fled the Nazis. My father did not survive the war, although my mother and I did. She remarried and my step-father, David Sattler, raised me like a real father, and I always considered him as such. He was a descendent of the Baal Shem Tov, the 18th century founder of the Chasidic Movement, but after the war he became a Communist. This mindset also influenced how he directed my education toward secular studies, but, while I responded to his guidance, I also had questions of my own. 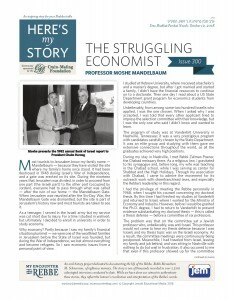 After we moved to Haifa, Israel, my parents found it hard to make ends meet. In order to bolster the family finances, I started to tutor younger children. It was then that I had my first major insight. I am naturally sensitive to interpersonal relationships, so I noticed a difference between the children studying in secular schools and those studying in religious schools. The religious ones had an air of calmness, and their relations with their parents were entirely different, much more respectful.